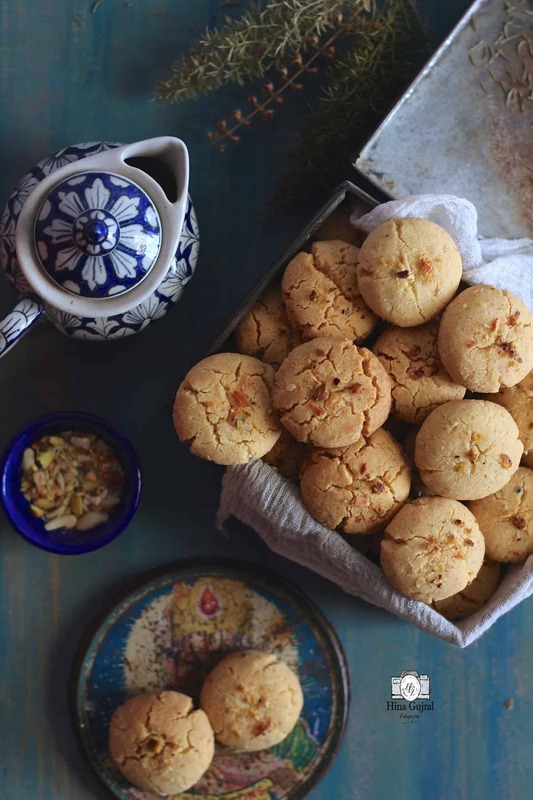 Nankhatai Recipe is a classic Indian eggless shortbread cookie prepared with ghee and gram flour. These days we all have fallen for fancy first world cookies with gourmet ingredients. 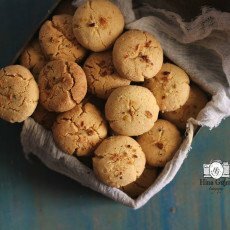 Somewhere Indian baked goodies have lost their glory, in fact, the new generation hardly recognizes these conventional cookies. When I baked Nankhatais, a wave of nostalgia hit me hard. 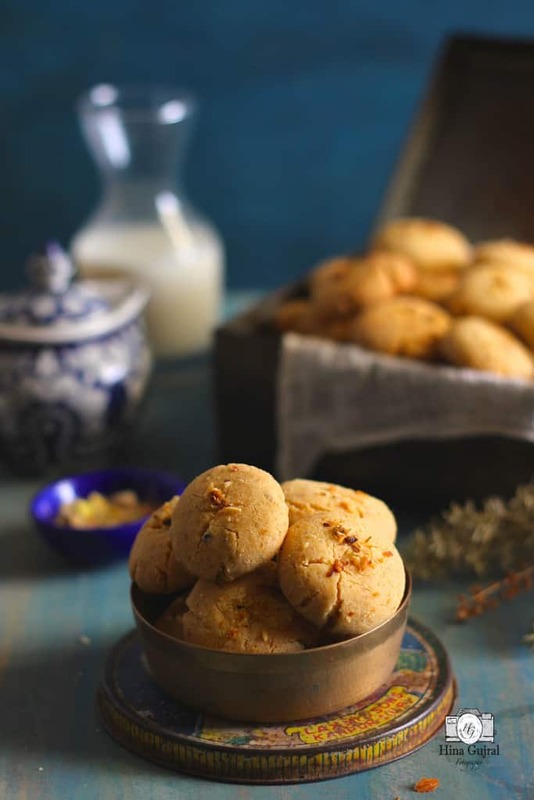 After tasting Nankhatai I was taken aback into the childhood days when life used to revolve around simple pleasures like Nankhatai. No matter how much I love Olive Oil but good old refined oil always has a place in my kitchen. Maybe it is intrinsic when I am cooking Indian dishes my hand first reaches out for refined oil. In my mother’s kitchen, there was always a large yellowish container of refined oil sitting above the kitchen cabinet. I still remember when for the first time after marriage I went for grocery shopping that same large yellowish container of oil was the only product familiar to me in the oil section. That was the day when for the first time I read its name – Saffola. Though now on my kitchen shelf Saffola has a tough competition with imported counterparts but I cannot think of my daily Indian cooking without it. 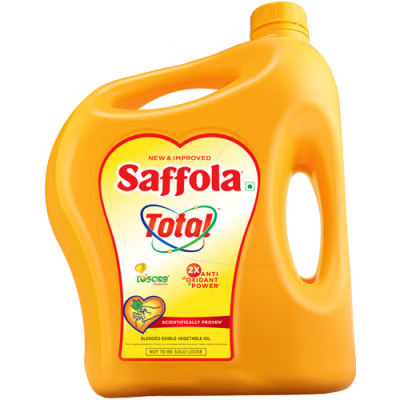 With the tagline of “Saffola Total protects better than olive oil” Marico launched the new range of edible oil called – Saffola Total, which blends of 70 percent rice bran oil and 30 percent refined safflower seed oil and is supposed to have twice the antioxidant power of olive oil along with lower absorption and specifically designed for Indian cooking. In December, The Hindu said, “Saffola pits itself against olive oil category,” and which is a competitive move, as supermarket shelves are flooded with unknown imported oil brands and consumers buying them without even reading the label carefully, just because it is tagged as Olive Oil does not make it a healthy choice for your family. I prefer to trust the brand, which is tried and tested by the family from generations rather than some unknown self-proclaimed imported oils. Though I am a regular user of Saffola Oil in cooking but never used it for baking or desserts. I always have this notion in my mind that olive oil/canola oil offers better results in deserts rather than refined oil. 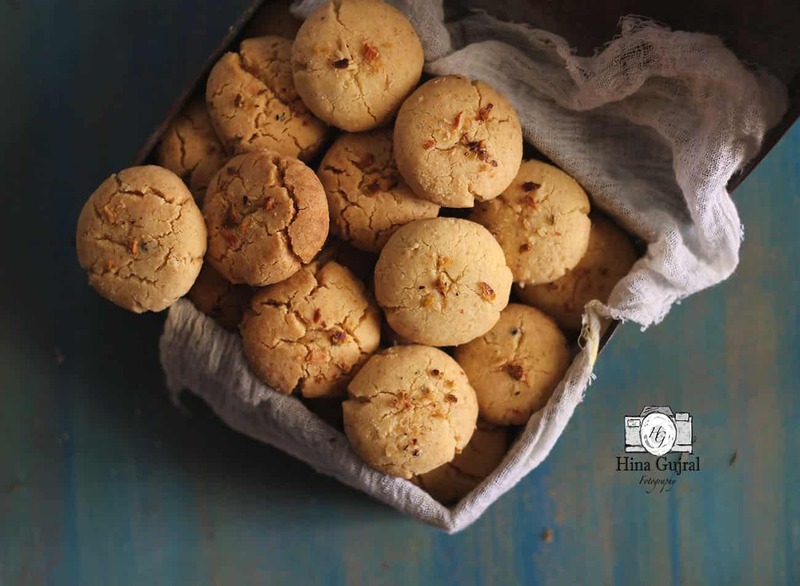 A few days back husband’s aunt-baked Nankhatai and she shared with me this most simple recipe of the Indian Shortbread Cookie. Her recipe says to use 1 Cup of ghee so I replaced it with Saffola Total. Though I was skeptical about the end result, the cookies were crumbly enough and taste exactly like what we use to buy from our neighborhood bakery years ago. So as the world continues to get healthy and fit, it doesn’t mean we have to completely give up our mother’s favorite recipes or our guilty pleasure snacks in the name of health. 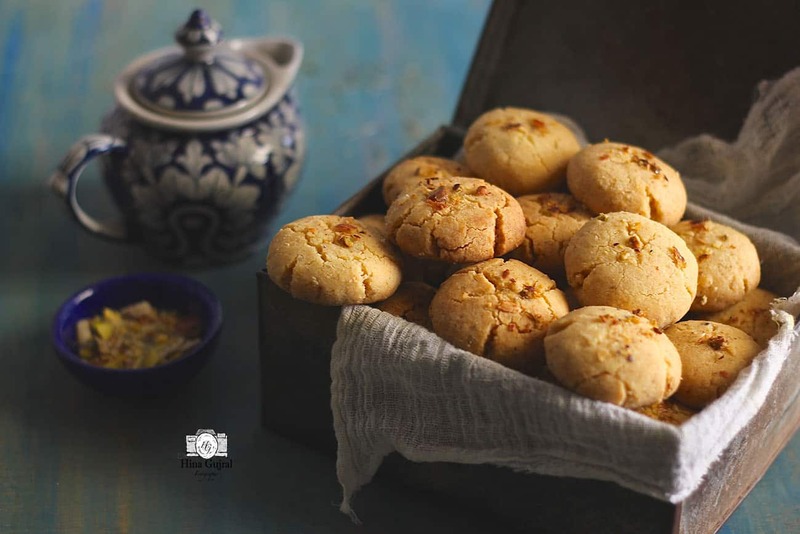 Nankhatai Recipe is a classic Indian eggless shortbread cookies prepared with ghee and gram flour. Cream saffola total oil and sugar together in a bowl for 3 – 4 minutes at low speed with hand blender ( buy it here ). Add the yogurt and beat again at low speed for 2 – 3 minutes. Rest the mixture for 5 – 10 minutes. Meanwhile sift flour, gram flour and baking powder together in a bowl. Mix in cardamom powder as well. Mix the sifted flour to the wet ingredients ⅓ at a time, once all of the flour is added try to form a dough with your fingers. Do not knead it just bind it together like shortcrust pastry. Transfer the dough to a clean bowl and let it rest for half an hour. Preheat the oven ( buy it here ) at 180 degree celsius. Line a baking tray ( buy it here ) with cookie sheet or parchment paper ( buy it here ). Divide the dough into thirty small balls and slightly flatten each ball with fingers. If you want sliced almond or pistachio can be put on top of each ball. Bake for about 25 minutes or you can check after 20 minutes. Let Nankhatai cool on a wire rack ( buy it here ) before transferring to container. Serve Nankhatai with a cup of tea or milk. After having burnt cookies in my last attempt, I am going to dare another try. This time I will be more careful with the time. love the pictures Hina, they look so inviting…hows ur vacation been?? I absolutely love Nankhatais. The cookies look so yum. I guess I will try making these before Holi. And Saffola remains very dear to most of the families. No other brand stands out as much as Saffola! Thanks for the review and the recipe! 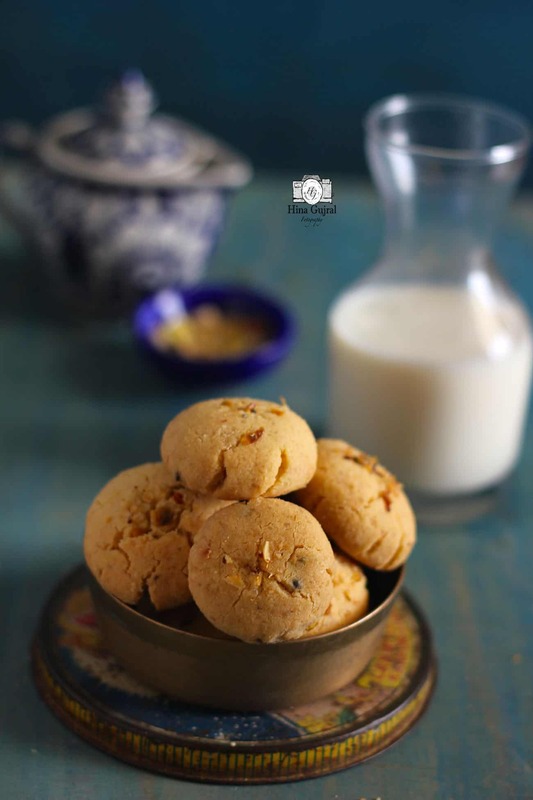 I made Nainkhatai yesterday looking at this recipe and to my surprise it turned out so good. Usually I’m miserable when it comes to cooking but Nainkhatais were yum. Thanks for the post and Saffola review. Thanks you so much and please do try the recipe.